Want to replace your ceiling light fixture or maybe you just update the look in your room? Or possibly you want to replace a ceiling light fixture that is just plain ugly. Sounds like an easy home repair, and, generally, it is pretty simple. But sometimes dealing with old wiring and electrical boxes in plaster ceilings and walls can be a bit tricky. This tutorial will show you the different things that can happen when you replace a ceiling fixture in an older home. Issues you may run into include crumbling insulation on old wires, reusing old ceiling fixture mounting brackets, and mounting screws being obstructed by a plaster wall. Next, let's see what you have under the old light fixture. Remove the fixture shade. How you do this will depend on the type of fixture you have. You may have to unscrew little screws holding the shade in place, unclip some clips as shown in the photo, or just unscrew the glass shade from the base. Once the ceiling fixture shade is removed, then remove the fixture base from the ceiling by unscrewing two little bolts that you will see attached to the base, or by removing a knurled knob fastened to a threaded tube in the center of the fixture as shown in the photo. Once the fixture base is removed, disconnect the wiring by unscrewing the wire nuts and remove the fixture base completely. Next, remove the old mounting bracket. With the old light fixture down, open up your new ceiling light fixture box. Carefully remove the glass shade and set it aside in a safe place. Remover the bag with all your fittings and bolts and set it aside. Remove the ceiling fixture base. 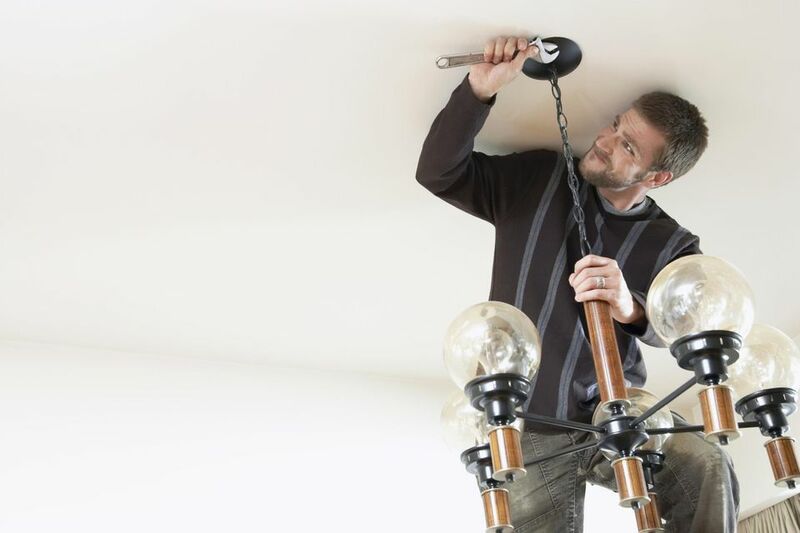 If you have a two lamp light fixture you may have an additional step in preparing the fixture. Your fixture may not have the hot and neutral leads for the lamp sockets wired together. In that case, twist the leads of the black wires together and then do the same for the white wires. With the ceiling light fixture base prepped, it is time to prep the fixture mounting bracket and decide how you will mount the bracket. Your light fixture came with a mounting bracket in the plastic bag of parts you set aside a couple of steps ago. Take it out and let's see what we have to do with the mounting bracket. First, take the bracket and align it with the fixture base bolt holes to see which holes in the bracket have to be used. In the upper left photo you can see that the outer most bracket holes are what need to be used. Next, you have to see if you can use the new bracket or if you can use, or have to use the old bracket. In the upper right photo you can see which existing mounting bracket holes line up with the new bracket mounting hole. This particular bracket is in a home from 1939. Although the construction quality is good, the new bracket will not work with the existing construction. There are no ceiling junction box screw holes available to fasten the new bracket, and the center post fastening the existing bracket to the ceiling electrical box is too large a diameter to work with the new bracket. Bottom line, the old bracket will have to be reused. Reusing the old bracket actually makes the work easier in one way, as the bracket is already in place. However the holes that need to be used are blocked with a plaster ceiling behind them. TIP: The trick around this problem is to drill out the ceiling behind the bracket holes you need. (If a drill is not available you can use a nail and a hammer to punch through the old ceiling behind the bolt hole). Take a 1/8" drill bit and test fit it in a bolt hole (with the drill off) to make sure the drill is smaller than the small mounting bolt hole and that the drill bit will not damage the screw threads. If the 1/8" drill bit is too big, use a smaller appropriately sized bit. Drill out the ceiling behind the mounting bracket bolt holes. The next step is to inspect the condition of the existing wiring's insulation. The insulation used on ​old wiring can fray and become brittle. OK, so you've taken a look at the existing wiring and it is in bad shape. It may be crumbling, brittle or may have an exposed wiring conductor. Ordinarily, you can just wrap 2 or 3 wraps of electrical tape around the damaged area. However, with old, brittle insulation, it will come apart and be made worse as you try to wrap the old wire and insulation with electrical tape. The solution in a case like that is to use heat shrink tubing. Heat shrink tubing is a special plastic that shrinks up when heat is applied to it. Pick a diameter of tubing that will go over the wiring but not be too big. If it is too big it will not shrink up tightly. Cut the tubing to length so that the exposed end of the wire will still be visible. Slide the tubing about 3/4" past the damaged area of the insulation. Apply heat to shrink the tubing by placing a hair dryer on "high" close to the tubing. Gently move the hairdryer back and forth to try and evenly distribute the heat. Once the tubing shrinks up, remove the hair dryer, you are done! Next, attach the fixture wires to the power wires, black to black and white to white. Use wire nuts to secure by twisting the wire nut clockwise until tight. With the wiring connected, the next step is to install the fixture base to the ceiling. The base will attach either by a threaded rod that attaches to the center of the ceiling mounting bracket or with two small long bolts as shown above. If you are using a threaded rod, then just slip the fixture over the rod and fasten together using the knob provided with your fixture. Once through the holes, slightly twist the fixture base in the direction necessary to have the bolts slide into their locking groove s allowing the bolt heads to be fastened against the base. Tighten the bolts and fasten the base to the ceiling. OK, you're just about done. Now just install two incandescent light bulbs. Do not use standard CFL light bulbs in an enclosed fixture because the CFL bulbs will fail and be a fire hazard. If you want to use CFL's for some reason, you must make sure they are specially marked and rated for enclosed fixtures or for dimmer use! Once the light bulbs are installed, just carefully install the fixture shade. This is usually done by twisting it on and aligning the grooves in the shade with the little bumps on the side of fixture base. Next, just turn on the light switch or restore power at the power panel and you're done!